A view of the temporary General Assembly hall. The measure, crafted by Brazil and Germany, was among the more than 65 texts recommended by the Assembly’s Third Committee (Social, Humanitarian and Cultural) yesterday on a range of issues relating mainly to human rights, social development and crime prevention. Noting that while concerns about public security may justify the gathering and protection of certain sensitive information, the text states that governments must ensure full compliance with their obligations under international human rights law. It calls on States to establish or maintain existing independent, effective domestic oversight capable of ensuring transparency, as appropriate, and accountability for surveillance and/or interception of communications and the collection of personal data. The resolution also requests the UN High Commissioner for Human Rights, Navi Pillay, to submit a report on the protection and promotion of the right to privacy in the context of domestic and extraterritorial surveillance and/or interception of digital communications and the collection of personal data, including on a mass scale, to the Geneva-based Human Rights Council at its 27th session and to the Assembly at its 69th session. 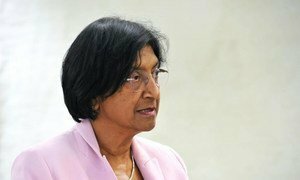 Earlier in the year, Ms. Pillay spotlighted the right to privacy, using the case of United States citizen Edward Snowden to illustrate the urgent need to protect individuals who reveal human rights violations. “Snowden's case has shown the need to protect persons disclosing information on matters that have implications for human rights, as well as the importance of ensuring respect for the right to privacy,” she said, adding that national legal systems must ensure avenues for individuals disclosing violations of human rights to express their concern without fear of reprisals. Mr. Snowden is a former National Security Agency contractor in the US who has been charged with leaking details of several secret mass electronic surveillance programmes to the press. He fled the country this past spring after the news broke, and according to media reports, he is currently in Russia. She also recalled that Article 12 of the Universal Declaration of Human Rights and Article 17 of the International Covenant on Civil and Political Rights state that no one shall be subjected to arbitrary interference with one's privacy, family, home or correspondence, and that everyone has the right to the protection of the law against such interference or attacks. “People need to be confident that their private communications are not being unduly scrutinized by the State,” she said. A senior United Nations official today stressed the need to respect the right to privacy, using the case of United States citizen Edward Snowden to illustrate the urgent need to protect individuals who reveal human rights violations.